We're pretty infatuated with this brand new print from nature cartoonist Rosemary Mosco, creator of Bird and Moon comics. The premise is simple: Assign each a bird a catch phrase that sounds similar to the sound it makes in the wild. By remembering the catch phrase, you can better identify the sound – and the bird that makes it! "This poster guide makes a great gift for animal lovers, teachers, [and] hikers," writes Mosco, "and any birds who sometimes have a hard time thinking of things to say." 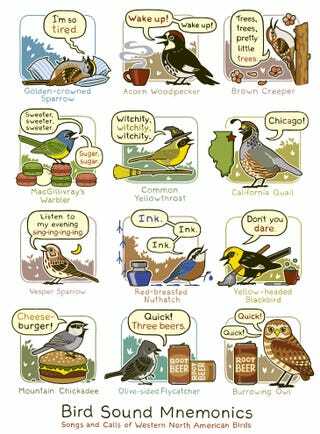 Mostly we love the idea of a bird who's call sounds like cheeseburger. We've written about Mosco's webcomics in the past. To see more of her work, check out her website, or purchase a print of your own!